Blue Ridge Electric provided opportunities for eight college students to work in internship positions this summer in offices across the system. Appalachian State University (ASU) student Austin Barker of Surry County worked as a Golden Leaf Scholarship corporate intern in the Watauga office. His respon¬sibilities exposed him to all aspects of membership services and operations. Another ASU student, Joshua Brooks, of Alleghany County, worked as an intern in the Innovative Energy Solutions department. He is seeking a Master’s of Science in Tech¬nology and currently serves as the development coordinator for ASU’s Renewable Energy Initiative. North Carolina State University student Agueo Lopez, also of Alleghany County, work¬ed in the cooperative’s corporate office as an intern in the engineering depart¬ment where he assisted with develop¬ment and implementation of programs in the areas of system electrical capabilities and reliability. Agueo is a past youth representative for Blue Ridge Electric’s Alleghany Member Advisory Committee (MAC). Sara Beth Ruppard, a Liberty University student from Caldwell County, assisted in the corporate office account¬ing department with various pro¬cesses for the finance, cost and consumer teams and also participated in strategic goals and assisted with process automation projects. East Carolina University student Nicole Fox of Watauga County returned for the second summer as an intern in the community relations depart¬ment to help with develop¬ing reports, promotional literature and social media. Kaylen Kent of Caldwell County also returned for the second summer to assist part-time in the human resources department with a new employee culture assimilation project. She will graduate from ASU in August with an MBA and has now been hired by the cooperative as a member services representative. Thomas Fleming of Caldwell County worked as an operations intern with Caldwell district crews. He is a recent graduate of Caldwell Community College and Technical Institute (CCC&TI) in the electrical lineman class. John Ball of Ashe County assisted in the Ashe district operations department. He is attending CCC&TI where he is pursuing an associate’s degree in electrical technologies. Blue Ridge Electric is pleased to have provided the opportunity for these interns to gain first-hand career experience. 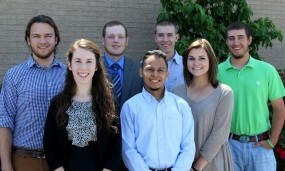 The interns worked with the cooperative from early June until mid-August. For more information about Blue Ridge Electric, visit www.BlueRidgeEMC.com. Blue Ridge Electric is a member-owned electric cooperative utility serving some 74,000 members in Caldwell, Watauga, Ashe, Alleghany, Wilkes, Avery and Alexander counties. This institution is an equal opportunity provider and employer.